A featherlight touch on the glass control panel brought up an illuminated display of numbers which corresponded to the tracks on the disc. You could select tracks in any order; you could see how long a track lasted and a motorised dust cover and automatic light were among the features that this stand-alone CD player possessed. The CD player was based around the Philips CD104, built in Belgium. As a standalone player, it lacked the Datalink and remote control facilities that its predecessor, the Beogram CD50, possessed. 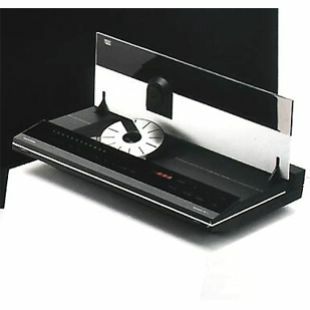 A good-looking CD player which performed well, it was later superceded by the Beogram CDX-2 in 1987. If Beogram CDX is in standby position and there is a compact disc on the platter, one push at the PLAY button will start the playback. If there isn't a compact disc inserted, you push the EJECT button and the motor driven dust cover will open, the platter will lift and the compact disc can be inserted. Apart from the above-mentioned PLAY and EJECT buttons, all operations are sensi-touch fields, which are operated with a slight touch. When pushing the field PLAY, the dust cover closes automatically and playback starts. The display indicates the individual tracks on the inserted Compact Disc. If it has more than 20 tracks, the two first digits in the time display will show the total. The time display has 3 main functions, which can be ordered by pressing DISPLAY, namely the time of the individual tracks, the elapsed playing time and index, which is a sub-division of the time of the individual tracks. ADVANCE and RETURN are used for jumping to the next or the previous track and are indicated with a flashing of the selected track on the display. With the digits 1 to 0, a track can be selected at random and the jump is marked on the display. With STORE and CLEAR you can select or leave out up to 40 tracks on the Disc. REPEAT replays the Disc up to 4 times. One push at STOP gives pause, and by keeping the finger on the field till the Disc stops, you get actual STOP. << and >> are used for fast search within the individual tracks.
" The CDX is one of two 'Beograms' which have been promised by B & O for some considerable time. It would seem that to a large extent B & O have edged, their bets, for the CDX is a Philips-based machine while the alternative model uses Sony-sourced assemblies. The CDX is an extraordinarily beautiful machine yet, as we shall learn, is based entirely upon the ever so humble Philips CD?101 (the same player as used by Meridian for the MCD conversion). The styling is obviously intended as match the other B & O units and so the company has an untapped market of existing owners who have been patiently waiting for a CD player. But it is a player well worth considering in its own right as a separate purchase. Unusually the CDX is a top loader but the lid assembly is powered and in response to the eject button the lid assembly smoothly folds back to allow the disc to be loaded. With the exception of the Eject and Power switches, all the controls are touch sensitive (using a type of capacitive sensing) a choice which I found far from reassuring since I kept wanting to use extra finger pressure to ensure a good contact! My overall lack of confidence was further encouraged by the all black control panel which reveals nothing until the power is applied. Perhaps it's too much like computer screen 'soft keys' for me for I kept wondering if the Play switch would be still in the same place every time I went back to this player! Two types of display are provided; a digital readout to show track time, total elapsed play time, and track numbers up to 99; and a bar scale of 20 LEDs to show the status of the first 20 tracks. A reasonable range of facilities is offered with both track skipping and fast searching (both backwards and forwards). Tracks can be pre-selected for playback and programming is possible for combinations of up to 40 tracks stored in the memory. Finally a Repeat mode allows continuous playback of the whole disc or of individual tracks. Once the CDX is opened some idea of B & O's inventiveness can be gained. Into the plastic casing has been dropped a Philips CD101 player complete down to the signal and mains supply cables but less the Switch/Display board. Instead B & O plug in wires from their own front panel and wire connections to their Eject and Power switches. The whole conversion is very neat and since the Philips player is left unmodified all the standard parts fit thus ensuring ease of service. It has to be said that providing the last word in performance is not needed; the Philips CD?101 is an excellent choice with the CDM mechanism being recognised for its good build quality and reliable operation (it is also to be found in the expensive Revox B225 player). The electronics design largely follows the familiar Philips circuit with 4 times oversampling conversion using a separate 14-bit DAC for each channel. In the laboratory the performance was much as expected with a generally flat frequency response except for a mild dip of 0.25dB around 7kHz; very low noise (?104dB); low crosstalk between channels and quite reasonable linearity. No problems were experienced when using the error testing discs and this player did very well in playing back some of my badly scratched discs with very few garbled passages. achieved. The sound can be characterised as open, exciting with a fine sensation of space and depth, and good stereo focus. The weaknesses were primarily at the extremes of the audio band with a warm, stodgy bass and a degree of harshness at high frequencies. However within the context of the B & O system the sound quality of this player would be considered quite excellent. CONS: Rather fiddly to use. Old fashioned top loading "